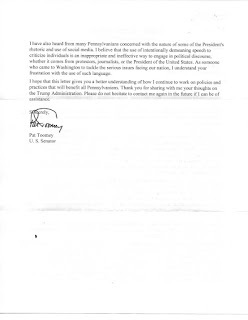 Last week while I was away celebrating free speech in front of Trump Tower I received two Toomey response letters. I'll deconstruct the first (dated June 15, 2018) today and the second (dated June 18, 2018) tomorrow. I am guessing that something's definitely shifted in the Toomey office as BOTH of the letters are 2-pagers. The last response we've received (see this post from May 27) was also a two pager. Safe to say this is now the default setting. 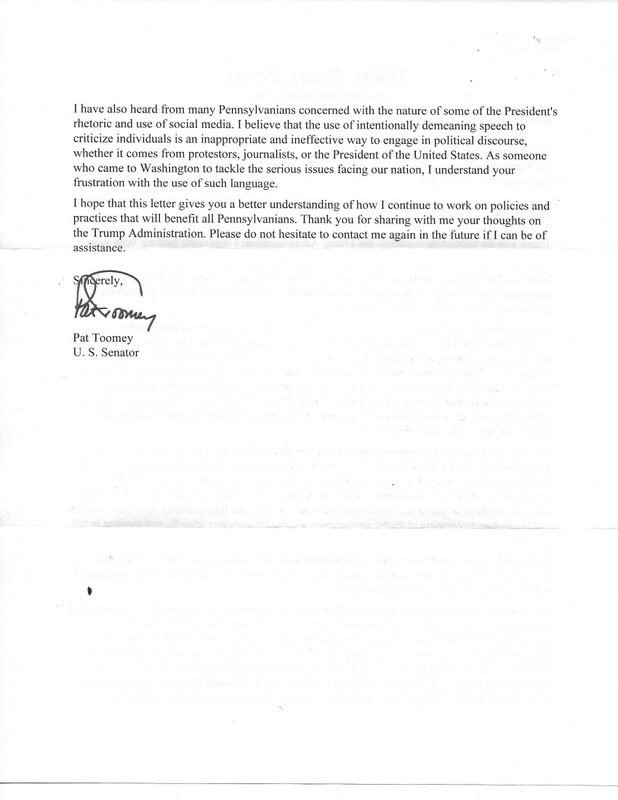 Now we have to determine which of my letters Toomey's office is answering. As I stated above, the letter's dated June 15, so it's safe to assume it's not commenting on any letter written after that date. So anything after the sixty-fifth is out. 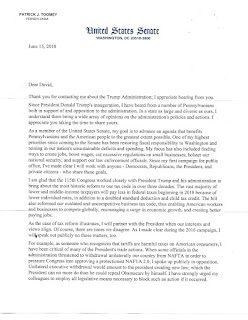 Since President Donald Trump's inauguration, I have heard from a number of Pennsylvanians both in support of and opposition to the administration. In a state as large and diverse as ours, I understand there being a wide array of opinions on the administration's policies and actions. I appreciate you taking the time to share yours. As a member of the United States Senate, my goal is to advance an agenda that benefits Pennsylvanians and the American people to the greatest extend possible. One of my highest priorities since coming to the Senate has been restoring fiscal responsibility to Washington and reining in our nation's unsustainable deficits and spending. My focus has also included finding ways to create jobs, boost wages, cut excessive regulations on small businesses, bolster our national security, and support our law enforcement officials. Since my first campaign for public office, I've made clear I will work with any one - Democrats, Republicans, the President, and private citizens - who share these goals. I am glad that the 115th Congress worked closely with President Trump and his administration to bring about the most historic reform to our tax code in over three decades. The vast majority of lower and middle-income taxpayers will pay less in federal taxes beginning in 2018 because of lower individual rates, in addition to a doubled standard deduction and child tax credit. One of my highest priorities since coming to the Senate has been restoring fiscal responsibility to Washington and reining in our nation's unsustainable deficits and spending. In CBO’s baseline projections, which incorporate the assumption that current laws governing taxes and spending generally remain unchanged, the federal budget deficit grows substantially over the next few years. Later on, between 2023 and 2028, it stabilizes in relation to the size of the economy, though at a high level by historical standards. As a result, federal debt is projected to be on a steadily rising trajectory throughout the coming decade. Debt held by the public, which has doubled in the past 10 years as a percentage of gross domestic product (GDP), approaches 100 percent of GDP by 2028 in CBO’s projections. That amount is far greater than the debt in any year since just after World War II. Moreover, if lawmakers changed current law to maintain certain current policies—preventing a significant increase in individual income taxes in 2026 and drops in funding for defense and nondefense discretionary programs in 2020, for example—the result would be even larger increases in debt. Projected deficits over the 2018–2027 period have increased markedly since June 2017, when CBO issued its previous projections. The increase stems primarily from tax and spending legislation enacted since then—especially Public Law 115-97 (originally called the Tax Cuts and Jobs Act and called the 2017 tax act in this report), the Bipartisan Budget Act of 2018 (P.L. 115-123), and the Consolidated Appropriations Act, 2018 (P.L. 115-141). The legislation has significantly reduced revenues and increased outlays anticipated under current law. 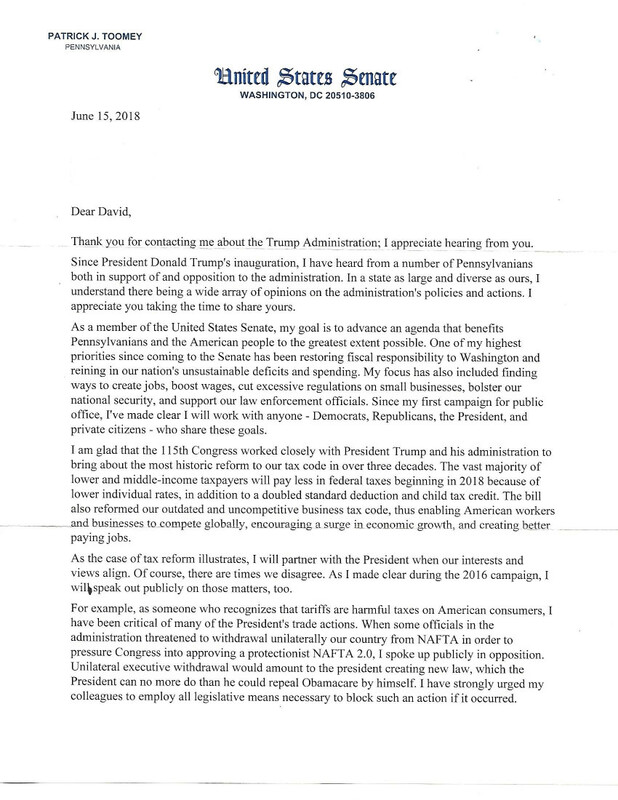 Toomey then looks to distance himself from Trump on an important issue: Tariffs, not Trump's blunders with North Korea (the subject of the sixty-fifth letter), or Stormy Daniels (the subject of the sixtieth) or even Trump's many many attacks on the Constitutionally protected free press (the subject of the fifty-second). No, he's most concerned about tariffs. I have also heard from many Pennsylvanians concerned with the nature of some of the President's rhetoric and use of social media. I believe that the use of intentionally demeaning speech to criticize individuals is an inappropriate and ineffective way to engage in political discourse, whether it comes from protesters, journalists, or the President of the United States. As someone who came to Washington to tackle the serious issues facing our nation, I understand your frustration with the use of such language. Notice, however, that Toomey almost immediately shifts to a "it's bad when the other side (protesters, journalists) do it too!" argument. The only problem with this argument is that "protesters" are not The President. Members of the press are not The President. Donald Trump (thanks be to Article II of the Constitution and not a majority of voters) is. He has the so-called "bully pulpit." Journalists and protesters do not. Whenever he speaks (or tweets) Trump is representing the United States. When a journalist calls Trump dishonest or when a protester flips off Trump Tower each are exercising a fundamental American right guaranteed by the First Amendment: The right to criticize those in power. Putting them on the same moral ground is absurd, Senator. It's also a way to deflect the discussion away from the topic: Donald Trump's behavior. Isn't THAT your point, Senator?